Practical Precision specializes in engineering lightweight and rugged high-performance optical systems for aerospace, defense, and security applications, including stabilized gimbals and payloads; hand-held imagers and targeting systems; weapon sights; and space based systems. Deliver more capability in a smaller package to your customers by leveraging our experience and expertise in developing multi-sensor systems and payloads that retain boresight alignment under harsh operating conditions, handle higher thermal densities with less space and surface area for cooling, and yet remain manufacturable and serviceable. Your product will be engineered to perform even after drops, weapon shock, or space launch – while meeting weight budget – through analysis-driven design, weight-optimized system architecture, and the application of high-performance, lightweight materials (including plastics, carbon fiber, beryllium alloys, and silicon carbide) in the optimum form, function, and combination. Practical Precision is a US small business providing engineering services to aerospace and defense companies including Northrop Grumman, General Dynamics, and FLIR. Many of the projects we work on are covered by ITAR. Our focus is engineering lightweight and rugged high-performance optical systems that are optimized for harsh service environments, including space, high-altitude, and the combat theater, including sea, air, and land. These systems range in size and operational mode from handheld to weapon mounted to man-portable to manned or unmanned craft-mounted to Earth- and space-based telescopes. Optically fused IR/image intensified sensor that clips on to weapon sight, meeting requirements for weapon shock and drops; ease of installation and operation; and weight. System for rapid attachment of boresighted laser rangefinders and other accessories to a handheld, battery powered EO/IR imager. Optical bench for man-portable laser designator including mounting and alignment mechanisms for boresighted sensors. Magnesium housings and optical benches for hand-held sensors. Beryllium-aluminum optical bench and housing for hand-held sensor. Flexure-based mounts and adjustments that withstand extreme weapon shocks and return to aligned state. 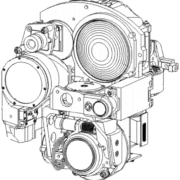 Stabilized gimbal 7.25 X 11 inch (184 x 280 mm) with boresighted NFOV LWIR, WFOV MWIR, and EO sensors; laser rangefinder; and laser designator. Designed azimuth and elevation axes of multiple stabilized gimbals from 3.5” to 9”, variously using engineering plastics, magnesium, aluminum, and beryllium-aluminum for structural components. Designed hybrid gimbal with beryllium-aluminum elevation and azimuth axes and aluminum payload to meet stability and weight requirements while managing costs. Analysis driven thermal management design of multi-sensor gimbal with on board video tracker board; system control board; motion control board and motor drivers; and power boards and power supplies. Posed serious thermal challenges, resolved with novel electronics mounting system, passive cooling, and athermalized structural design. Stabilized gimbal with 3.5”/90 mm diameter, swappable payload including boresighted EO sensor/IR sensors/laser pointer and other configurations. Combination of magnesium and engineering plastics used for optical bench and structure. For use with small, battery powered UAVs. Integrated maritime gimbal with custom-packaged inertial navigation system, electronics, and stowing/mounting mechanism that met strict performance, weight, shock, vibration, natural frequency, and EMI/RFI goals. Developed carbon fiber gimbal payload covers. Designed novel telescope for satellite communication by laser using silicon carbide components and adhesive- and SiC slip-bonded assemblies. Dynamic analysis-driven optimization of structure to ensure survival during launch and separation and performance during operation, while meeting strict weight budget. Design of SiC-to-metal interfaces, including gimbal mounting, that withstands thermal cycling. Developed structural concept for space-based astronomical telescope using silicon carbide. Designed multi-sensor (laser, IR, visible) payloads with strict boresight and boresight retention requirements for harsh environments and handling. Advanced materials for optimized weight, stiffness, and strength – engineering plastics, composites, silicon carbide, beryllium alloys, ceramics, titanium, magnesium.